The threat of two escaped convicts and a missing friend lead Lizzie on a harrowing journey through the wilds of the Adirondacks in this stunning novel from National Book Award finalist Beth Kephart. Thirteen-year-old Lizzie’s favorite place in the world is her uncle’s cabin. Uncle Davy’s renovated schoolhouse cabin, filled with antiques and on the edge of the Adirondacks, disconnected from the rest of the world, is like something out of a fairy tale. And an escape from reality is exactly what Lizzie needs. Life hasn’t been easy for Lizzie lately. Her father abandoned their family, leaving Lizzie with her oftentimes irresponsible mother. Now, her mom has cancer and being unable to care for Lizzie during her chemotherapy, Mom asks her where she’d like to spend the summer. The answer is simple: Uncle Davy’s cabin. Lizzie loves her uncle’s home for many reasons, but the main one is Matias, Uncle Davy’s neighbor and Lizzie’s best friend. Matias has proportionate dwarfism, but that doesn’t stop him and Lizzie from wandering in the woods. Every day they go to their favorite nook where Matias paints with watercolors and Lizzie writes. Until one day when Matias never arrives. When news breaks about two escaped convicts from the nearby prison, Lizzie fears the worst. And when Uncle Davy goes missing, too, Lizzie knows she’s the only one who knows this area of woods well enough to save them. Armed with her trusted Keppy survival book, Lizzie sets out into the wilds of the Adirondacks, proving just how far she’ll go to save the people she loves. Beth Kephart is the award-winning author of books for both adults and young readers. 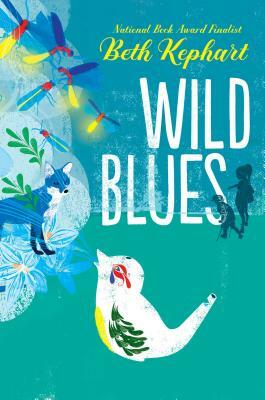 Her most recent novel, Wild Blues, was named an ALA Youth Editor’s Choice. She lives in Devon, Pennsylvania, where she teaches creative nonfiction at the University of Pennsylvania. Lizzie’s mom has been diagnosed with cancer and needs treatment, and she asks her 13-year-old daughter where she wants to spend the summer. Lizzie chooses to be with her uncle Davy at his renovated schoolhouse cabin in the Adirondacks. Despite her worry over her mother, she is excited to spend time with Uncle Davy, a television star who specializes in antiques, and her friend Matias, an El Salvadoran boy who suffers from proportionate dwarfism and paints beautiful watercolors. Addressing a mysterious listener directly, Lizzie relates the unexpected events that unfold: the kidnapping of her friend and uncle by two convicts escaped from the nearby prison, the steps Lizzie takes to rescue them, and the terrible aftermath of the crime. Lizzie is an honest, heroic character who is fascinated by biology and the world around her. Kephart’s novel features passages told in stirring poetic language and with a sophisticated, descriptive tone: “The shadows between the trees beyond the lake are not always bears or wolves or rats or snakes. The end of the world isn’t always the end.” Lizzie’s story of friendship and family is also one of literary depth; readers will be entranced by this exceptional offering from National Book Award–finalist Kephart. “This is a victim impact statement,” says thirteen-year-old Lizzie in the book’s opening. She insists, though, that there’s a larger story behind the statement, and moreover, there are choices that shaped the story, decisions she will parse out and pick through as she recounts what led to her current stay in a hospital, in what’s gradually revealed to be the aftermath of an event involving two escaped prisoners in a massive national forest and two of Lizzie’s favorite people, her uncle Davy and her friend Matias. Let’s start at the beginning: when Lizzie’s mother must undergo treat- ment for thyroid cancer that will made her radioactive, Lizzie chooses to spend the summer with her uncle at his cabin in the Adirondacks. Wait, is that really the beginning? Or did Lizzie’s story start when her celebrity uncle lost his lover and found peace in the woods, woods that Lizzie came to see as her second home over the years? Certainly, her friend Matias’ choosing to wait for Lizzie at their special meeting place in the forest is directly linked to his kidnapping, but if they hadn’t selected that spot last year or if they had changed their plans, all of the ensuing drama could have easily been avoided. Then there’s the young woman, so desperate to win her imprisoned father’s love that she goes to illegal lengths to help him, with terrible results. And, to go full circle, isn’t Lizzie’s own father, who took off years ago, responsible for Lizzie having to go anywhere in the first place when she could have stayed home with him had he been around? Similarly, sporadic illustrations, watercolors ostensibly by Matias, seem to hint at events and places. All of these circumstances take shape in a way that eventually leads Lizzie to decide to head out into the wilderness to find her missing friend and uncle, who may have been abducted by two convicted murderers. The past and the present slip and slide through Lizzie’s narration as she tells her story to an off-screen listener; the format speedily brings tension—it’s clear from the start that something bad has happened—and it also allows for an intriguing disorientation, with the clues to the identity of her audience sparingly but strategically laid out. Lizzie moves between giving the facts of her pathfinding and survival in the woods and winding though long tangential thoughts, where she ponders all of pieces that had to fall into place to put her in her current predicament. The result is a story that has both a compelling urgency and an engrossing, if often bitter, thoughtfulness. There is a barely contained fury to Lizzie’s voice, as she thrashes against the idea of victimhood, mocking any proposal at healing (“They say telling heals. I’m not persuaded”), even as she recognizes how impactful her trauma has been, and how much she needs help, for the sake of herself and those who love her. Her insights come with a sting of lessons learned, and she recognizes that more difficult than healing her broken body will be living with the terrifying truth that every slight choice has entirely unpredictable consequences, whether immediately or down the road. With a girl battling the wildness of nature, the unpredictability of humans, and the whims of the universe, this is a survival story in its truest sense. Award-winning author Kephart brings her trademark lush, lyrical prose to her first middle-grade novel. As her mother begins cancer treatment, 13-year-old Lizzie jumps at the opportunity to spend the summer with her mom’s estranged brother, Davy, in the refurbished schoolhouse he calls home in the Adirondacks. Lizzie treasures the time she spends not only with Davy but also his neighbor Matias, an immigrant from El Salvador with proportionate dwarfism. But when Matias fails to meet up with Lizzie one afternoon, it quickly becomes clear that not all is well—there’s been a prison break nearby and the authorities believe Matias has been kidnapped. Lizzie takes it upon herself to find him. to be told, as Lizzie’s voice, alternating between stream-of-consciousness and emotional outbursts, invites readers to participate in structuring this powerful narrative.